Sew Mama Sew, wants to know about my, and your, sewing machine. Here's the scoop about mine. How long have you had it? A little over a year. How much does that machine cost (approximately)? I paid just over $200.00, it was a special price, now it's priced at $249, I just did a web search. What types of things do you sew (i.e. quilting, clothing, handbags, home dec projects, etc.)? I'm a quilter, so I sew quilts. I've used it for clothing and an occasional home project. How much do you sew? I sew almost every day. That's what I do during my spare time, in the daylight hours. How much wear and tear does the machine get? A lot! Do you like/love/hate your machine? Are you ambivalent? Passionate? Does she have a name? I ♥ ♥ ♥ my Janome. She doesn't have a name, but I don't name my cars, either. What features does your machine have that work well for you? I mainly straight stitch, that's the nature of quilting, but everything I try works great. Is there anything that drives you nuts about your machine? No, everything works, period! When we retired and downsized, 15 years ago, I gave up my sewing room and gave away my huge ol' machine. I purchased a Brother to have, "just in case". I didn't sew much, because I hated that Brother. It was a hot mess, every time I used it. One of my daughters had the same machine and we'd cry about how horrible it was. I was quilting for about 2.5 years before I said, enough is enough, and did my research and got the Janome. Would you recommend the machine to others? Why? Yes, all the time. 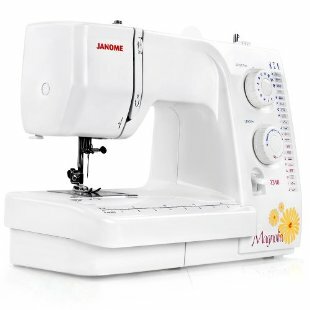 My local sewing machine repair guy says Janome is the best brand out there, bar none! What factors do you think are important to consider when looking for a new machine? Reliability and dependability. Do you have a dream machine? Not really. If I hadn't downsized, I might want a long arm machine, but I'm a practical gal, and I've found a fabulous long arm quilter just a couple of miles from me. Bonus: Do you have a great story to share about your machine (i.e., Found it under the Christmas tree? Dropped it on the kitchen floor? Sewed your fingernail to your zipper?, Got it from your Great Grandma?, etc.!)? We want to hear it! I don't get a bonus. No facinating stories about my machine, it's just great. Day in, day out, great. Since I'm a quilter, I threw in some photos of my quilts. Want to do your own review, go here. Very interesting! I always wonder about other machines. I have a Bernina that I've been happy with. Your quilts are beautiful. I absolutely love the one with leaves! Thank you for your review! I'm on the hunt for a machine and your experience is appreciated. Your quilts are gorgeous! I'm mostly a cushions/curtains gal but those blankets make me want to quilt!! Very interesting. I saved and purchased a bernina thinking I would FMQ on it (it's probably their least appropriate model to do this on but couldn't afford the next model up) but haven't got around to it.